ESPRESSO — the Echelle SPectrograph for Rocky Exoplanet and Stable Spectroscopic Observations — has passed ESO’s Preliminary Acceptance Europe (PAE). 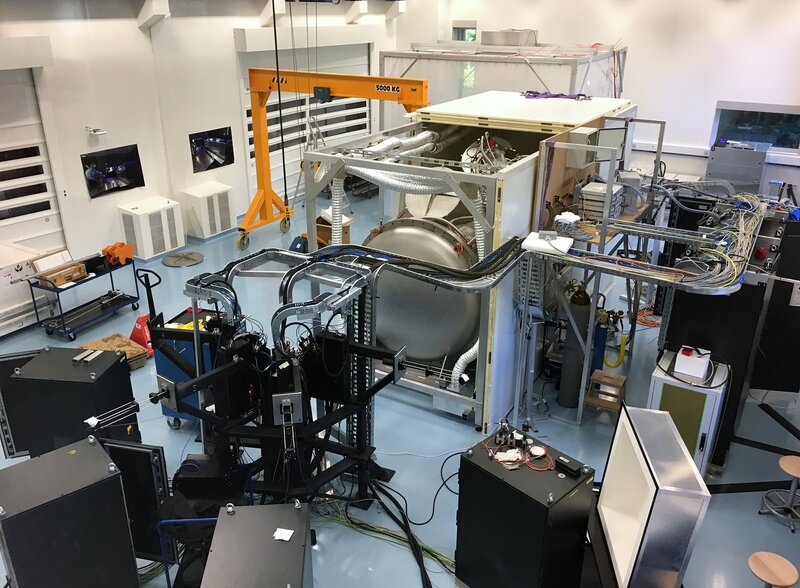 This means that it has successfully completed all preliminary testing, and the instrument will now be packed up and shipped to Chile, where it will be installed at the combined coudé focus of the Very Large Telescope (VLT). ESPRESSO is expected to see first light later in 2017. ESPRESSO, an echelle spectrograph, is one of the most eagerly awaited instruments in the astronomical world . It is the successor to ESO’s planet-hunting HARPS instrument on the ESO 3.6-metre telescope at La Silla, and will exceed HARPS’s precision by about 10 times . As the next-generation planet hunter, ESPRESSO will measure minuscule changes in the light from stars, as planets — many of them smaller than Neptune — rotate around them. This radial velocity method, as it is known, records tiny changes in the motion of the star arising from the planet’s gravitational influence — the star “wobbles” as the planet goes around it. The smaller the planet, the smaller the wobble, and in order to detect small, rocky and potentially life-bearing exoplanets an instrument with very high precision is required. Using this method ESPRESSO will be able to detect some of the smallest planets we expect to find . Like HARPS, ESPRESSO will also be used for follow-up observations of transiting candidates — where a planet passes in front of its host star as seen from Earth — to confirm their planetary nature and measure their mass, as well as for transit spectroscopy of exoplanets. This latter observational technique allows astronomers to determine key constituents of a planet’s atmosphere, such as sodium or water vapour. ESPRESSO will use light collected by any one of the four Unit Telescopes (UT) of the VLT, but it will also be able to gather the light from all four UTs at once, resulting in a collecting area equivalent to a single telescope of 16 metres in diameter and enabling it to observe very faint objects. This will allow us to probe the deepest recesses of the Universe by observing with high precision the intergalactic medium between us and very distant quasars, allowing us to investigate whether the fundamental constants of physics have changed with time, or in space. ESPRESSO is being designed and built by a consortium consisting of: Astronomical Observatory of the University of Geneva and University of Bern, Switzerland; INAF-Osservatorio Astronomico di Trieste and INAF-Osservatorio Astronomico di Brera, Italy; Instituto de Astrofísica de Canarias, Spain; Instituto de Astrofisica e Ciências do Espaço, Universities of Porto and Lisboa, Portugal; and ESO. The HARPS instrument can measure the motion of a star with a precision of better than one metre per second, whereas ESPRESSO will aim for a precision of a few centimetres per second, thanks to advances in technology and its placement on a much bigger telescope. The radial velocity method is very important if we want to know about the physical properties of an exoplanet, such as its mass. When combined with results obtained by other methods, such as the transit method, even more information can be inferred, including the size and density of the exoplanet. ESO’s Next-Generation Transit Survey (NGTS) telescope at Paranal hunts for exoplanets using the transit method.